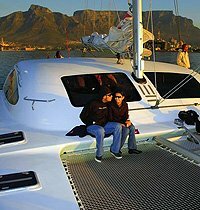 Catamaran sailing in Table Bay on board the "IQ" sailing catamaran, offers you the opportunity to view the abundant marine life along the coast of Cape Town. Whales, dolphins, penguins, seals, giant sunfish and a huge variety of pelagic bird life have been spotted on these regular cruises. 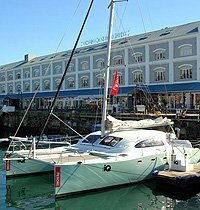 The "IQ" berths outside the Victoria and Alfred Hotel on the North Wharf adjacent to the Den Anker and Green Dolphin restaurants. IQ is 50ft long, custom built in epoxy and foam core, very light and strong and extremely fast. Powered by twin Yanmar 45hp diesels with 3 blade Gori feathering propellers she is powerful under motor. The boat has a fully fitted galley, large stainless steel fridges, 4 double cabins, three large well ventilated toilets and a huge canopy-covered cockpit for the guests. 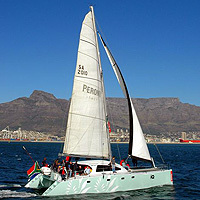 Bay Cruise to Robben Island, Blouberg beaches or Clifton beaches depending on weather and wind direction. "Happy Hour" Cruise on Table Bay. Sunset Cruise on Table Bay. Catamaran sailing - For bookings and enquiries for the daily cruises (click here). Return from Catamaran Sailing page to Homepage.